From bright orange winter pumpkins to summer's soft green courgettes, the cucurbit family is an easy vegetable to grow organically. And they taste good! Roasted and softened with garlic; stewed in soups or curries; sweetened in pies; even the seeds can be tasty toasted. Is it a squash or a pumpkin? It seems you can choose your name, as they are all related, with many different varieties. See below for the fascinating technicalities. From October onwards is the best time to enjoy winter squashes - from the Halloween pumpkin to the exotic Turban and the Golden Hubbard. Here is a quick guide to help you choose your favourite for next season's growing. Just be sure to plant into rich, composted and well-mulched soil - cucurbits are greedy plants. For growing advice see the Garden Organic How to Grow cards. Why not save the seeds from your pumpkin - they can be cleaned and stored, ready for you to grow your own pumpkin next year! Take a look at our step by step video. The classic round Halloween fruits that turn bright orange when ripe. There are two forms - C. pepo and C. maxima. The former has white and slightly watery flesh, and depends on a good full season to ripen, while the latter has orange and firm flesh. They all store well over winter. Atlantic Giant has the largest fruits, while Triple Treat has hull-less seeds that can be eaten as pumpkin nuts. These look like miniature pumpkins, small enough to be cupped in the hand and perfect for individual servings. 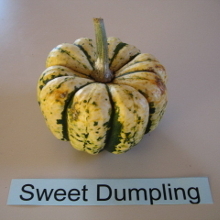 Jack be Little has orange flesh; Sweet Dumpling (pictured) has the distinctive green markings. The Golden Hubbard, with its rich orange colour, is the classic winter squash popular in the US. Golden Nugget is similar, but grows in a bushy habit (all the others trail). 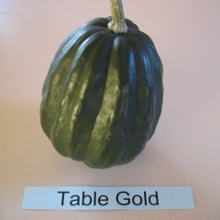 Onion Squash has has a distinctive bulb shape, and the Warted Hubbard, has a green skin which lives up to his name. Although they look like marrows, they store throughout the winter, and have a firm, creamy-coloured flesh. One of the best winter squashes for flavour, it looks a little like its namesake. Table Ace has dark green, ridged skin and orange flesh. Table Gold (pictured) has creamy-white flesh. Hard-skinned and buff coloured, with cream coloured flesh, this popular squash stores well and is very versatile in the kitchen. One of the most distinctive in looks, almost like a cottage loaf, it stores for a long time throughout the winter. The skin is often a deep red and orange mottled, with green streaks. It will be sure to catch the eye. Like the Kubocha in shape and flesh, but with a curious blue-green skin - which contrasts beautifully with the bright orange flesh. Queensland Blue has ridges, and Triamble has three cornered fruits. Curiously, and despite their name, the Banana Blue and Banana Pink have fruits which start yellow and turn pink when ripe. The flesh is orange, thick and creamy with a good flavour. These elongated fruits can get huge, and you can even get a Jumbo Pink Banana, grown in the US as cattle feed. Another smaller squash which is a convenient single serving and fruits prolifically. You can train them vertically and often get 20 or more fruits per plant. 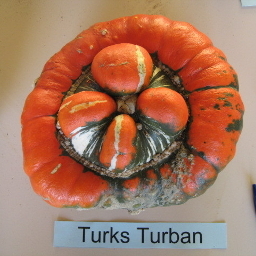 There are two forms, one stays green and the other ripens to orange, both with orange flesh. If you want to grow some less-well known but interesting varieties of squashes, why not join the Heritage Seed Library? You need to be a member of Garden Organic first, see Join Us. If you add on membership of the HSL (a further £1.50 a month), you will be supporting and saving some of our heritage varieties, all of which are not commercially available. The catalogue is full of delights. 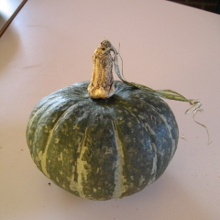 C. maxima - the winter squash, with a hard skin and orange flesh which stores well. C. pepo - produces courgettes, marrows (C. pepo medullosa), summer squashes (C.pepo melopepo) and some winter squashes. There is also the C.pepo verrucosa, a warted ornamental gourd, and C.pepo ovifera which is decoratively egg-shaped. These three species combine, however, which can be confusing. The botanical differences can be easily identified by the fruit stalk: an angular, hard stem which is quite slim and deeply furrowed indicates the C.pepo, while a round, thick, soft and slightly corkey stem indicates C. maxima. C.moschata has an angular stem which enlarges markedly next to the fruit. In truth, it is the flesh and storage ability of the fruits which help us to group the varieties, rather than their botanical origins. Especially when it comes to their culinary use. Winter squashes - have a hard skin and usually orange flesh, and they can be stored undamaged for many months in a cool, dry environment. The flesh - which can be cooked both as sweet or savoury - is used in soups, pies, curries and salads, and sometimes as a bulk thickening agent in processed foods such as baby food. Summer squashes - do not store well, and are better eaten when young. Courgettes and vegetable marrows are a good example. Their flesh is often watery with little flavour.